Lauren Hopps is the recipient of the ABC Medical scholar-athlete scholarship. Congrats Lauren! 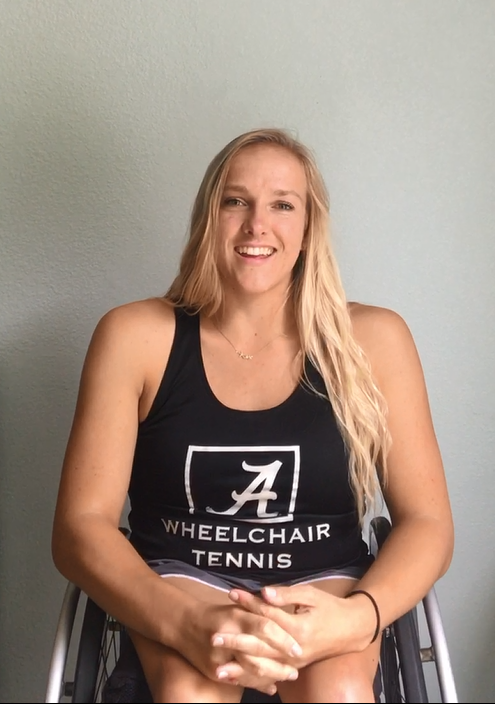 A San Diego native, 19 year-old student-athlete is currently studying kinesiology at Alabama and plays for Alabama Women's Wheelchair Tennis Team. She recently returned from the Wheelchair Tennis World Team Cup in Italy, where she represented Team USA. Lauren was diagnosed with Sacral Agenesis at birth, a congenital disorder in which there is abnormal fetal development of the lower spine—the caudal partition of the spine, which requires Lauren to use a wheelchair,walker, and orthopedic KFO's for mobility . Years of physical therapy during her childhood helped her grow strength and endurance. "Her whole life, she was a little go-getter" her mom says in an interview with NBC 7. She played wheelchair basketball and archery as a kid and was the first ever wheelchair tennis player on an able-body tennis high school team in all over the San Diego County. "I believe that it is important to make a difference in the lives of others. I have always been interested in helping the community or my peers in any way that I can. I love to spend my time volunteering and helping those that are vulnerable or need support." Lauren worked with Chelsea's Light Foundation as a Student Ambassador, where she increased awareness and participation for their annual run. She even got a team started at her high school to run alongside her in the 5K. "After contributing time and effort for a cause I care so deeply for, finishing that race in my wheelchair taught me about the importance of determination. I am so thankful for those three years and have learned so much about being a bigger part of my community. It truly was an ever life-changing experience. I feel that it is my job to teach others about determination and hard work through giving back." 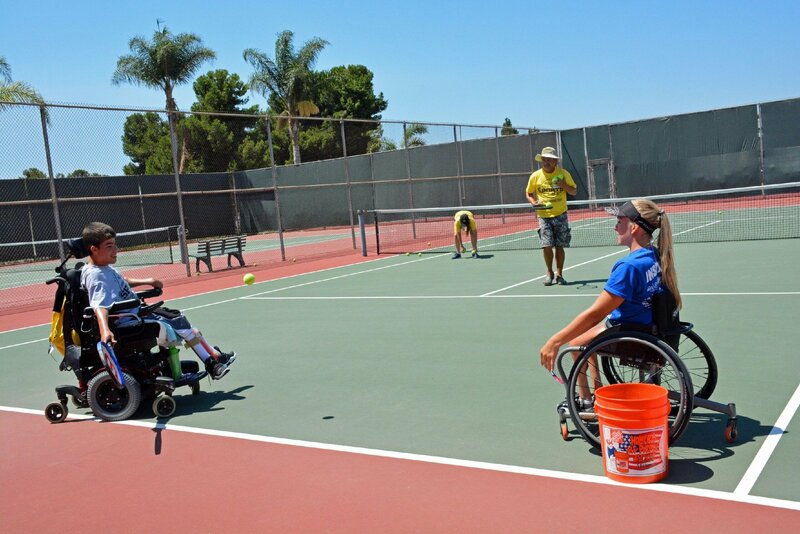 In the past 3 summers that she's been a student at Alabama, she returns to her hometown San Diego to coach disabled kids how to play wheelchair tennis. "That camp was a camp that I attended as a young girl myself. It is amazing how life provides us with opportunities that come full circle. Giving back to something that was part of my beginning and has given so much to me was so important." "Wheelchair Tennis is My Biggest Passion in Life"
Lauren started playing wheelchair tennis in 7th grade, when she was searching for an activity "that would lead me towards living an active lifestyle and give me a goal to push towards." As soon as she rolled on to a tennis court and and hit her first shot over the net,"I knew wheelchair tennis was the sport for me." "My high school team was so important to me; it taught me what it felt like to be a part of a bigger team that supports one another instead of focusing on only my game. As a senior, after three years of working hard on junior varsity, I made it on the varsity team. My dedication in wheelchair tennis outside of high school tennis has lead me to bigger advancements in my level of play, taking my game to the next level" says Lauren. 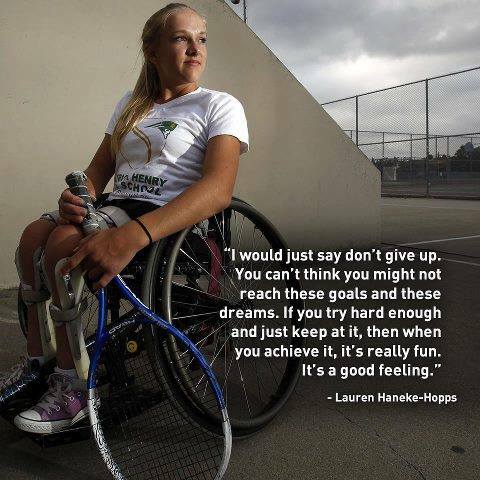 In her senior year high school, Lauren was recruited to play wheelchair tennis for the University of Alabama. She started in the fall as a freshman, training hard and traveling with her team to compete at different tournaments. What does Adapt.Believe.Compete. mean to you? If you were to win this scholarship what would you use it for? Winning this scholarship would provide me with additional opportunities in the form of competition and travel. I would be using these funds to help me attend more wheelchair tennis tournaments, to further my experience in competing. My long term goal is to represent the US in the Paralympics in Tokyo 2020. With funding to attend more tournaments, I will be able to experience higher level of competition, increase my skillset, and continue my efforts to improve my physical and strategical game. Congratulations to Lauren Hopps again and best of luck in her future endeavors!!! Roll Tide! Are you a student-athlete with a disability who wants to play at the collegiate level?